Ivan Evstratiev Geshov - eminent politican and banker. Public and political figure; publicist. Member of Bulgarian Literary Society (later the Bulgarian Academy of Sciences). Minister. Prime Minister of Bulgaria(1911-1913 г.. Came from the well-to-do family of traders, the Geshovs. Graduated Financial and Political Studies in Manchester, UK. In 1872 he got back to Plovdiv, where he had a commercial business. He financially supported community centers and schools in Plovdiv. In 1873 he founded the Charity Brotherhood, which funded the closing of the construction of the St. Trinity School. During the April Uprising (1876), he sent articles to the Times Newspaper regarding the Turkish attrocities, which was the reason to be arrested and sentenced to death (1877). Geshov was only released due to the advocacy of the British and American Consulates. After the Liberation (1878), Ivan Ev. Geshov was very active in the public and political life of the new province of East Roumelia. He was one of the leaders of the Peoples Party, and chief editor of the first newspaper of unified Bulgaria - the Maritsa newspaper. M.P. of the provincial National Assembly of East Roumelia, as well as its first Chairman. Director of Finances of East Roumelia in the period 1882-3 (i.e. financial minister). 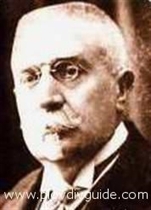 In the period 1911-13 he was Prime Minister of Bulgaria.